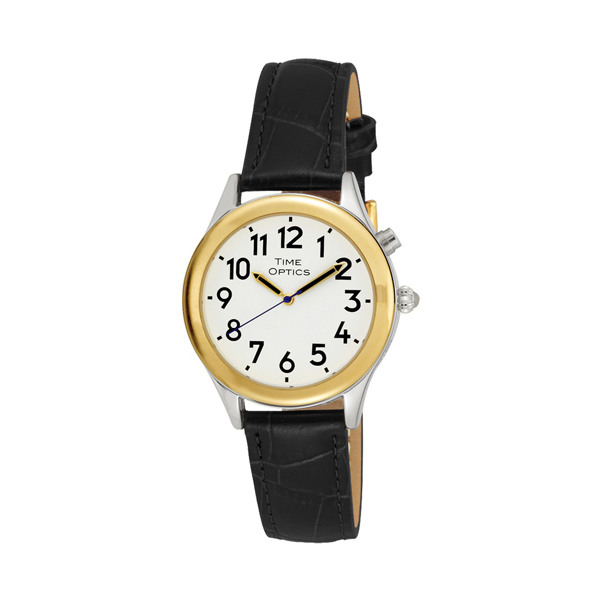 Ladies Talking Watch with two tone case and Genuine Black Leather strap, is a classic timepiece for everyday use. The Genuine Leather band is a textured black croco grain strap that adds elegance to the watch. As with all Time Optics talking watches, we use our Unique Talking Chip that has both male and female voices along with an added alarm feature. The clean white dial with bold black numbers and sapphire blue second hand make it easy to read, along with a push of a button to hear our crisp clear voices announcing the time, day, date, month, year and alarm feature. Adorned with a cabochon pumpkin crown, this watch is classic and fashionable and also good for people with vision issues. As with all of our Time Optics Watches, this timepiece is packed in a velveteen pouch with warranty and instructions.